Amtrak passenger train 501 derailed onto Interstate 5 this morning, according to CNBC. First responders are reportedly treating the incident as a “mass casualty incident,” though there is no official announcement regarding injuries. The derailed train is blocking the southbound lanes of the interstate. Update: At least six have been reported dead. Seventy-seven have been taken to the hospital. 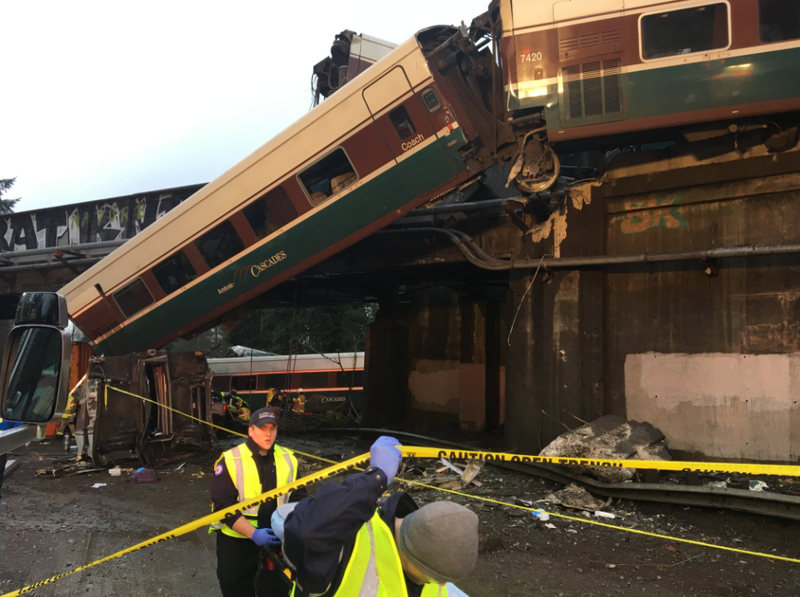 A tweeted photo of the derailment from the Washington Department of Transportation shows a train car on its side with numerous emergency vehicles nearby. WDOT has also announced southbound I-5 road closures for an “extended period” and for drivers to expect heavy traffic on alternate routes. Preliminary information regarding the derailment, from the Pierce County Sheriff’s Office, was that the train was heading south. There are reported injuries and casualties. Local news outlet KKTV reports that train 501 left Seattle at 6 a.m. PST this morning and was to arrive in Portland, Oregon later today. The derailment supposedly occurred around 7:45 a.m. PST. Update 12:10 p.m. EST: A spokesperson with the Washington State police told Jalopnik that I-5 has been closed in the immediate vicinity. Ed Troyer, a Pierce County Sheriff’s spokesperson, reportedly told news outlets that three people on the train were killed, but no motorists were injured. according to The Seattle Times. Train 501 was on its inaugural run when it derailed. It was the first time Amtrak trains used the new Point Defiance Bypass route that was designed to reduce the length of trips. Monday morning was the first time Amtrak trains used the new Point Defiance Bypass route. It was the culmination of a $181 million project that began in 2010. A new Amtrak station also opened in Tacoma. The change would reduce the length of the trip by 10 minutes and separate Amtrak trains from freight lines that frequently cause delays on the Point Defiance route. Update 12:18 p.m. EST: The Pierce County Sheriff’s Office has released photos from the derailment via Twitter. Update 12:40 p.m. EST: A total of 77 patients were transferred to hospitals in Pierce and Thurston counties, with four having the most severe injuries, reports KATU. Yet, the full number of dead and injured is still unclear. Update 12:50 p.m. EST: National Transportation Safety Board announced that it is “launching a go-team’ to investigate the Amtrak derailment. They are leaving from DC today. Below, you can see a Google Maps photo that shows where the derailment happened. The thin, gray line to the left of the red pin are the tracks. Update 1:02 p.m. EST: Amtrak’s latest statement confirms that there were approximately 78 passengers and five crew members on board Train 501. Those injured are being treated. A passenger named Chris Karnes, who is the chair of Pierce Transit’s advisory board, told CBS News that the section where the train derailed was supposed to be rated at 79 MPH. He said that at least seven cars derailed from the tracks and that the emergency doors weren’t working properly. Passengers had to kick out the windows to escape. Update 1:12 p.m. EST: Reuters has a particularly damning report, writing that Lakewood Mayor, Don Anderson, had issued a warning earlier this month about the high-speed trains and their proximity to cars and pedestrians. Lakewood is one of the towns that the new track travels through. Additionally, the outlet reports that the official, who was briefed on the investigation, said that the train might have hit something on the track before derailing. Update 2:01 p.m. EST: Washington State Patrol said that I-5 will be closed for the remainder of today, possibly into tomorrow.